by M.G. Piety.In Publishing News.5 Comments on Publishing News! Self, Value, and Narrative … defends a series of interrelated claims about the nature of the self. [Rudd] argues that the self is not simply a given entity, but a being that constitutes or shapes itself. But it can only do this non-arbitrarily if it has a sense of the good by which it can be guided as it chooses to endorse some of its desires or dispositions and repudiate others. This means that there is an … ethical or evaluative dimension to selfhood, and one which has an essentially teleological character. Such self-constitution takes place in narrative terms, through one’s telling–and, more importantly, living–one’s own story. …. Rudd develops these ideas in a way that is importantly different from others familiar in the literature. He takes his main inspiration from Kierkegaard’s account of the self, and argues (controversially) that this account belongs in the Platonic rather than the Aristotelian tradition …. 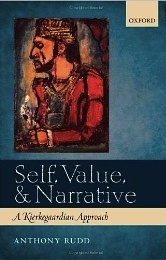 Through close engagement with much contemporary philosophical work, Rudd presents a convincing case for an ancient and currently unfashionable view: that the polarities and tensions that are constitutive of selfhood can only be reconciled through an orientation of the self as a whole to an objective Good. Rudd showed me a paper several years ago in which he was developing this idea of the Platonic roots of Kierkegaard’s concept of the self. If I remember correctly, he was scheduled to give that paper at a meeting of the Central Division of that APA and wanted some feedback on it. I thought then that it was excellent and am very pleased to see that the ideas he expressed in that paper have now been more fully developed and made available to the general public in this volume. I’m less excited about the publisher. When I went to purchase the book on Amazon, I was shocked to discover that Amazon’s discounted price was $75 and that it was not yet available as an ebook. I shouldn’t have been surprised by the price. Both Oxford and Cambridge are notorious for pricing their books out of the range of everyone but the independently wealthy–and university libraries. I had suggested to Rudd, when he was shopping for a publisher, that he try Baylor. Baylor did a fantastic job with my book Ways of Knowing, and they priced it at a very reasonable $49.95 (hard cover). I actually made money off that book, more money, in fact, than I made off the translations I did for Oxford (which makes me wonder just what Oxford is doing with all the money they are making off authors). More annoying is the fact that the book is not yet available as an ebook. What’s up with that Oxford? I buy almost exclusively ebooks these days. I’m an unabashed fan of them, despite the recent propaganda campaign against them. I’m going to buy Rudd’s book, of course, because I know it will be excellent. I don’t have to buy it immediately, however, because I won’t be able to get to it immediately, so I encourage everyone to go to the Amazon page for the book and click the “Tell the publisher! I’d like to read this book on Kindle.” Maybe if enough people do that, it will be out in a Kindle edition soon. I have more good news on the publishing front. Thom Satterlee has sold the Danish rights to his book The Stages: A Novel. It’ll be translated and published by Rosenkilde & Bahnhof in time for SK’s b-day this May. Congrats Thom! That is indeed one incredible sounding book abstract. And almost every word of that abstract is so suggestive of themes that I want to see explored (and explore) that I really want to go buy this book right now (although I also only ebooks now, so guess I will have to try and wait). My own reading of SK is often (to my disappointment) that he doesn’t have a view like the above. I’d so love to have my reading corrected. Thanks for blogging about this book! Did you click on the “Tell the publisher!” link? If you haven’t please do that. I think OUP will need a lot of pressure to issue the book in an electronic format. Very nice hearing from you; no words for a long time, Marilyn. As you probably know I finished IKC in 2010 and am now trying to catch up on 20+ years of reading, at least a good part of it. Sylvia works along on her next book, which she says will be a short one or a long essay. So that means she is still thinking out its parameters. Thanks for the news on Rudd’s new book. Well, back to the TV. This was a huge Obama day here, from breakfast to lunch in two places. The Democrats of Deland are banqueted-out tonight. There were probably 1500 blacks and whites for breakfast and 3-400 for mostly blacks and a few whites for lunch at the Chisolm Center. We are always especially invited so we go. I do not know how we got on their short list, but we are glad to be there. The Chisolm is center a black community center. Bob, It’s good to hear from you too. What’s Sylvia’s new book about? I could do a post about it (or at least include it in a post on publishing news. What are you up to? If I remember correctly, you said you were working on Karl Schmidt (sp?). How is that going?